The 2010 GT250R raises the benchmark for lightweight sport bikes! With the all new electronic fuel injection, revised riding position, lightweight and stronger stylish top triple clamp, sleek newly designed tail section, the competition has its work cut out. The GT250R is the first modern 250 sport bike in twenty years. The chassis is a dual lateral bar frame designed to reduce weight and lower the center of gravity. 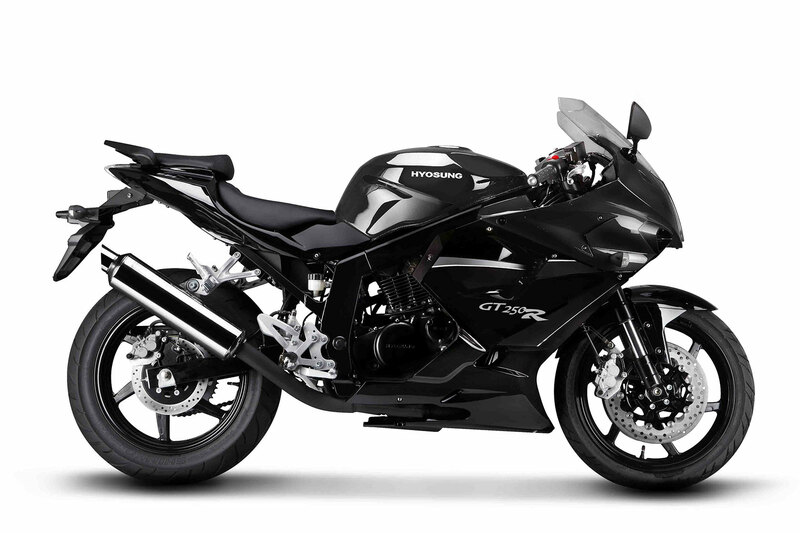 The GT250R shares the distinct styling of the GT650R featuring a 2 stage projection beam for greater visibility and VFD (“Vacuum Fluorescent Display” commonly used in luxury automobiles for the digital displays). Hyosung Motors America to take on the Japanese brands with fuel injected 250cc motorcycles. NORCROSS, GA (10-13-2009) – Hyosung Motors America has formally announced the release of their 2010 GT250, GT250R and GV250 motorcycles. The latest models feature a number of improvements over last year – most notable is the addition of fuel injection. Other functional and cosmetic upgrades include a redesigned tail section on GT models and a strengthened frame on the GV. All Hyosung 250cc motorcycles will continue to feature fuel gauges. More details, images and a dealer locator page can be found at www.hyosungmotorsusa.com. 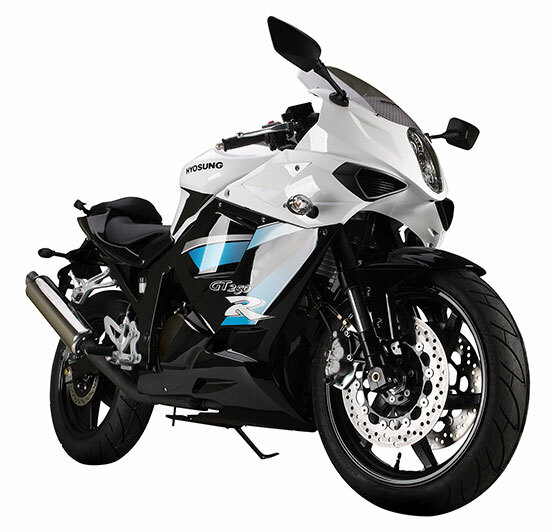 Hyosung Motors America is a division of S&T Motors, the largest motorcycle manufacturer in Korea. Started in 1978, Hyosung motorcycles, scooters and ATVs ranging from 50cc to 650cc are sold in Asia, Australia, North and South America and Europe. Hyosung Motors America is gaining recognition as the newest major player in the extremely competitive US motorcycle market. South Korea has been doing more than scanning the northern horizon for missiles in recent months: it’s been busy preparing for the launch of its own missiles. The Hyosung motorcycle range has been given a major facelift and now features fuel-injection across the entire 250cc and 650cc V-twin 2010 model range. The popular GV250 and GV650 Aquila cruisers retain their signature styling and robust, powerful engines, but now have the added benefit of EFI. The EFI system provides seamless power throughout the rev range and smooth idling from cold. The GT250 naked sports commuter and the GT250R sports model also feature EFI. Completely restyled with aggressive new lines, LED stop/tail-lamp and clear indicator lenses, they are set to regain their place at the top of the 250cc sales charts. EFI also takes a front row seat on the three-model 650cc GT range. The GT650 naked, the half-faired GT650S sport tourer and the GT650R sport all feature the new styling changes, plus improved braking with four-piston callipers gripping 300mm semi-floating discs on all three models. Great news for learner riders too. 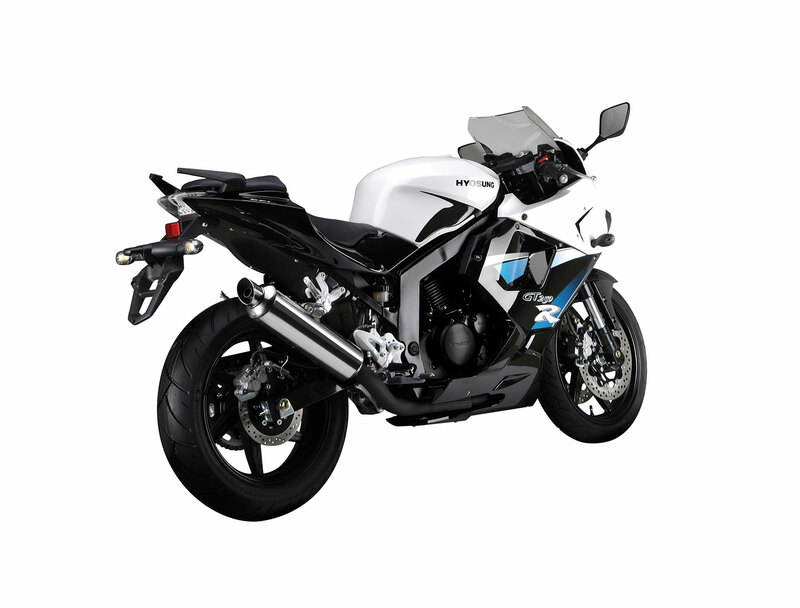 The 250cc models are automatically learner approved, but so too are all four 650cc models. The LAMS approved 650cc EFI models now deliver 40kw, up from 25kw on previous models. The non-LAMS 650cc versions pump out a healthy 59kw. The new styling and technical updates are additional to an already value packed range with all models featuring USD forks (except GV250), grunty V-twin engines and now EFI. LAMS is not available in WA. It is available in all other states now and Queensland from July 1, 2009.